The best business card is the one printed on bone paper with Silian Rail lettering. The second best business card is the one that you roll out yourself using custom embossers. How can we do that, you ask? To design your own version of pocket business card, you need to have some know-how of 3D modelling and a little understanding of TinkerCAD or SketchUp and Voila! you can make any type of card you like. 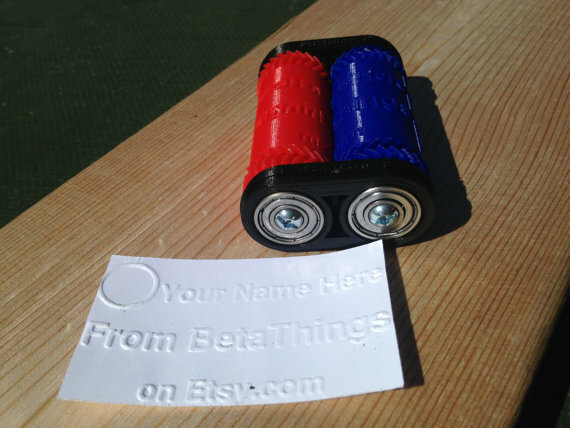 To make the 3D printed tubes roll, you need some bearing as well (Myers uses skateboard bearings). It’s true that this business card is not as elegant as one with fine lettering, still being able to print your own cards is a close second. Let us know if you try this yourself!